Series of 4 Podcasts available by going to http://www.johnselig.com/ and click 'Podcast'. Most of you receiving this know that I have been hosting and producing my “John Selig Outspoken” podcast for the past 18 months. It has been most rewarding and proven to be a combination of my creativity and enjoyment in speaking with people while providing an achieve for guests who are predominantly lesbian, gay, bisexual and transgender leaders and opinion makers along with writers. My goal has been not only to inform my audience but also to provide a venue for guests to promote both their stories and accomplishments. So far, I have produced 57 episodes and have been extremely proud of the results. My audience is broad in that I am fortunate to have many straight people listening in as the interviews are in depth and provide a great deal of information about my guests as well as what they do that makes each one of them special. One guest, Bill Browning, who is the founder and editor-in-chief of The Bilerico Project, described John Selig Outspoken, “Think ‘Inside the Actors Studio’ meets NPR.” WOW, what a nice compliment and it succinctly summed up my goal for the podcast. I would like to invite you to listen into a unique series of podcasts that I have just completed. In fact, I believe it to be my best work to date and I dare say that there is nothing else like it anywhere on the Internet. The series I am referring to includes four episodes (54-57) about Native Americans. 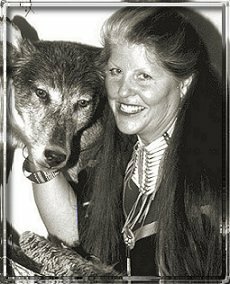 The first episode (54) is a set-up episode featuring my dear friend and famed author, Patricia Nell Warren who introduced me to EarthThunder, a Cherokee, lesbian, medicine woman and shaman. EarthThunder is a lesbian but sexual orientation discussion is probably no more than 1% of our interview. I strongly encourage folks have a listen regardless of their sexual orientation. I guarantee a unique experience. EarthThunder’s shared perhaps the most remarkable story I have ever heard. She was born around 1947 in Idaho, where she still lives today. Both of her parents were indentured servants who were prohibited to have children. I know that this is hard to believe still possible in 1946. When EarthThunder was born her parents were murdered and she was given to her grandparents and extended family to raise. She spent the first 10 years of her life in the wild not knowing that there were other human beings in the world other than her family. She never saw a highway, a car, other people, airplanes, or electrical lines. Summers were spent in the mountains of Idaho at 8,500 feet above sea level and winters were spent in caves with food and animal hides to get them through the bitter cold, When EarthThunder was 10 her entire family was murdered in front of her, then thrown into a mass grave. Those unimaginably horrifying images still haunt her. EarthThunder was taken to an orphanage and adopted out to a physically and sexually abusive family. She later obtained one of the first juvenile emancipation cases in Idaho when she was 14. She was placed in school not speaking a word of English and looked at other students in horror as they wrote with pencils, which she thought were chopped off fingers that had been sharpened. She clutched her hands tightly to protect her fingers. On the way to school she rolled in animal feces each day as she had been taught to keep insects away; she was severely punished for doing so. EarthThunder went on to become a Medicine Woman and a Shaman. She has an IQ of 180, which enabled her to overcome her learning challenges. She went on to receive a number of college and graduate degrees and has been studied in depth in a multiyear research program at Stanford University. EarthThunder joined the civil rights movement in the 60s and spent time getting to know and march with Dr. Martin Luther King Jr. Among her many accomplishments EarthThunder has been an international mediator working with world leaders to negotiate agreements. She has studied indigenous people from around the world from Africa to Russia to Australia to New Zealand and South America. I attempted to interview EarthThunder on 4 different occasions starting last September and the first 3 attempts didn’t record. I ended up purchasing new software and the fourth attempt worked. I blamed my challenges on technology. EarthThunder mentioned that throughout her life most attempts to record and photograph her have failed including attempts by one of Madonna’s sound experts. My conversations with EarthThunder took place over a 2-day period held on December 13th and 14th. They include over 3 ½ hours of interview material. I have compressed our conversations into three episodes running from one hour to ninety minutes in duration (including opening and closing comments along with music). What is so exceptional about these episodes is that not only does EarthThunder share her unique story but also she shares her wisdom and vision that reflects her training and grounding as a Native American. Her thought process is mind blowing to those of us raised in the modern Eurocentric world. It showcases deep tradition and intellect that blossomed from Native Americans which European settlers called savages. Listeners will see the world through a set of eyes different from their own. I am a non-religious person but I found my time with EarthThunder to be spiritual and uplifting. She is grounded, no-nonsense, humorous and earthy. For somebody who has endured more pain than is imaginable EarthThunder is full of love and hope and is open and giving. The first of the four episodes features an interview with Patricia Nell Warren as Patricia has spoken to me about EarthThunder for years and she introduced EarthThunder to me last summer. Patricia published her book, “One Is The Sun,” back in 1991 having lived with Native American relatives for 10 years while she was researching the book. It is a historical novel based upon a Medicine Woman who lived 150 years ago in the Deer Lodge Valley of Southwestern Montana where Patricia was raised. While Patricia grew up she had heard stories about this medicine woman whose name was EarthThunder. Imagine Patricia’s shock when she was contacted several years after “One Is the sun” was published by the modern day EarthThunder. Patricia got to visit and befriend EarthThunder over the years and I am forever thankful to Patricia for sharing EarthThunder with me. During episode 54 Patricia shared her experiences living with her distant Native American relatives, what she went through in researching her novel, getting to know EarthThunder and a great deal of information on Native Americans. Patricia provided the perfect introduction for the interview with EarthThunder. The three episodes featuring EarthThunder are a journey and they build as you get to know her. EarthThunder shares her personal story but more importantly her wisdom, insight and both love and deep reverence for our planet and all living things that inhabit it. In addition to the music that I feature during every podcast from my friend Jeffrey Reid Baker I also was able to obtain the rights to include music from Douglas Blue Feather an award winning songwriter, recording artist and performer of contemporary Native American Flute Music. My interest in Native Americans began during my childhood in Huntington, Long Island, located 40 miles east of New York City. Many nearby town names were of Native American origin including: Massapequa, Wyandanch and Wantaugh. A street near by my home has a name that I love until this day called, Ketemowoke Drive (say that one three times fast after enjoying a glass or two of wine). Huntington is historic and surprisingly was sparsely populated until after WWII when suburbia blasted onto the national scene (which is hard to believe being so close to New York City). I remember my dad telling me that when they purchased our home that there was only one traffic light downtown. Boy did things change as the population exploded during the 50s and 60s. The first few years after our family moved into my childhood home in 1953 it wasn’t uncommon to find arrowheads while gardening. I spent eight summers at camp in the Sebago Lakes region in Maine and I was constantly enthralled by the Native American heritage of the land, lakes and rivers near my camp. I fondly remember my camp director, Mr. Streeter, sharing stories about the Native Americans who had lived nearby. He was the consummate story teller and my eyes would open wide as he spoke while the entire camp sat around a campfire located on a point that jutted out into Crescent Lake. His voice resonated as sparks rose to the heavens, We heard the crackling of wood burning along with the lake’s water lapping against a nearby dock and sailboats moored a mere 100 yards from where we were sitting on logs listening to every word. I have many fond memories of my eight years at Camp Kingsley, none fonder then the many camping trips I went on via canoe. My interest in Native Americans blossomed further while living in Arizona for fifteen months in the mid 90s and traveling extensively through both Arizona and New Mexico over the years. John Selig Outspoken, like pretty much everything else I do in my life, celebrates diversity. The world is so much richer from the diversity of its people. I have featured guests of all races, sexual orientations and backgrounds. Since coming out I have wanted to learn more about how sexual orientation has been looked upon by Native Americans and the opportunity to spend time with EarthThunder far more than I anticipated. I am proud of all my podcasts. I have been so fortunate to have a long list of guests each of who are personal heroes to me. These four episodes, however, stand out because they are so different from my own life experience and the experiences of most of my audience. Please note the podcasts are listed in reverse order with the most current episode being the one at the top. You will want to scroll down to episode 54 and listen to them in order as it really does make a difference. Also, my podcast blog included photos that you won’t want to miss along with links to websites for EarthThunder, Patricia Nell Warren and Douglas Blue Feather. Enjoy! I would love to hear your reactions after you have listened to them.